The little island of Hopen seems to be the place currently regarding rare wildlife observations. Just a few weeks ago a polar fox attacked the station’s dogs, later it appeared to have rabies. Only a few days later, the crew of the weather station Hopen Meteo got a wildlife observation of century class. Generally, polar bear sightings are nothing unusual on Hopen. During some winters, there are several hundred polar bear observations close to the weather station. But the event observed on 04 May was truly unique! 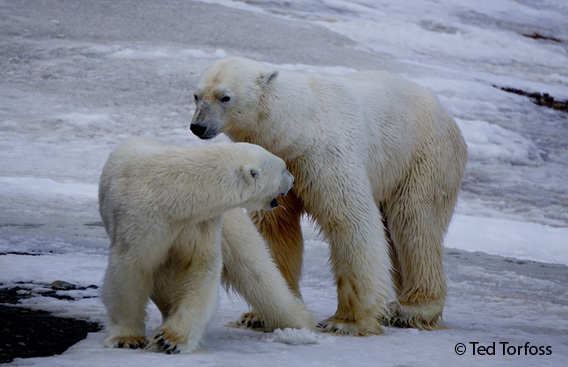 Initially, the weather station crew thought that the two polar bears that came close to the station might be a mother and her second year cub, having a little family dispute as they kept roaring against each other. Here, the situation is not yet clear. Photo © Ted Torfoss. Routinely, the station crew made attempts to scare the polar bears away with making noise. The bears went away, but only to return later. They had obviously been hunting successfully in the meantime, as evidenced by traces of blood on the face. Soon it became appearent that it was not an everyday polar bear visit, but that they were a male and a female about to mate. After a while they got down to serious business. Being totally busy with themselves, the bears did not pay much attention to their surroundings but kept mating for a good hour, with obvious pleasure as the photos suggest. The 4 crew members of Hopen Meteo hence got the opportunity to enjoy an observation which is not just once in a lifetime, but much rarer actually. Obviously, they took the opportunity to take unique photos. Here are some amazing shots by meteorologist and photographer Ted Torfoss who made good use of this chance of a lifetime and I thank Ted for his kind permission to show some of his photos here! For more photos, visit the webseite of the Hopen weather station. Maybe the whole thing was a birthday present by nature to Ted Torfoss, who could celebrate his 60th birthday soon after the event? Anyway, happy birthday! Of course, polar bears are mating every year and the event as such is common in polar bear areas in nature at this time of year. But as a small number of individuals is spread out over immensely large and very remote areas, observations are very few and far between. There are not many photos or footage taken. No earlier observations are known from Hopen, which would be the hotspot in Svalbard for such an occasion given the density of polar bears in good ice winters and the presence of the weather station. A few weeks ago, a group of lucky tourists also saw polar bears mating in the distance in Tempelfjord not far from Longyearbyen. Photos taken by guide Yann Rashid were seen by many on the web and have without any doubt scarcity value, but they do not compare to the photos taken from a much smaller distance by Ted Torfoss on Hopen.